I created my home blog, Red Leaf Style, to share ideas to inspire people to create a home they love. Even if that means making do with that old couch while they save up. Or, painting the kitchen cabinets because it’s too expensive to buy new. Like most bloggers, I started a blog to delve into a topic I love. But unlike most bloggers, I also created it to hone my writing skills. And in 2009 when I first created it, I was venturing into the relatively new world of web writing. Today, I wish I had more time to devote to it. But whenever I can manage to crank a post out, take my own photos, and do some keyword research, I get so much satisfaction and joy from it. Check out all of my blog posts for Red Leaf Style at redleafstyle.com. Want to see just one? Here’s one of my favorite blog posts I’ve written for Red Leaf Style. This blog post hits all the points that make Red Leaf Style a happy place for DIYers. 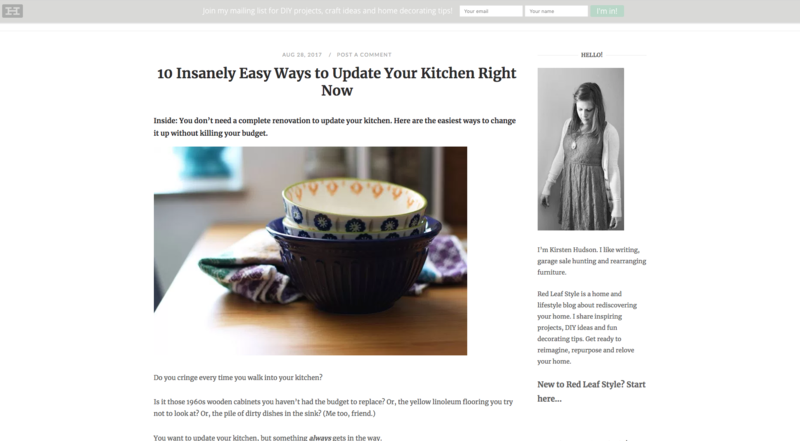 It includes easy tips to update your kitchen without remodeling, explains how I face the same struggles as the average reader, and digs deep into the topic (1,000+ words).